For those motorists planning to travel the Pennsylvania Turnpike this week, have no fear-it is not abandoned. But there is a 13-mile stretch of the Turnpike, with three tunnels and a travel plaza, east of the Breezewood area, that was bypassed in 1968 and dubbed "The Abandoned Pennsylvania Turnpike." To see what led up to the bypassing of this stretch of the highway is to go back in time to the Turnpike's origin. West portal of the Sideling Hill Tunnel. Note the snow removal so that the area could be used. 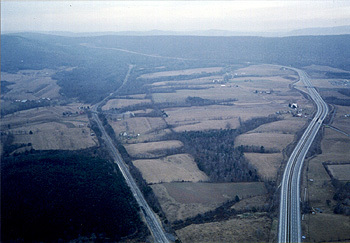 The Turnpike originally began as a railway route. The construction began in the 1880s but was never completed, even though a combined total of 4.5 miles of tunnel had been dug through seven mountains. Called the "Tunnel Highway" or "America's Super Highway," the seven-tunnel Pennsylvania Turnpike opened 60 years later in the fall of 1940 as a four-lane highway. For truckers, the down-hill travel on the low grades would be mechanically safer, and all motorists could enjoy a safe journey while also saving time. At a cost of more than $61 million, the 160-mile roadway took 770,000 tons of sand, 1,200,000 tons of stone, 50,000 tons of steel, and more than 300,000 tons of cement to complete. The 24-foot wide lanes, divided into 12-foot lanes, accommodated the width of vehicles, but shrunk to 11.5 feet wide inside the tunnels where the double lanes ended and only one lane in each direction began. In 1941, after one year of operation, the Pennsylvania Turnpike Commission reported more than two million cars had traveled the road. By 1960, however, there were many more vehicles on the roadway causing congestion and delays at the tunnels. Some of these delays were as long as five miles. After a study was conducted to alleviate the problem, it was decided that it was more economical to expand the Blue, Kittatinny, Tuscarora, and Allegheny Mountain tunnels with new parallel tunnels, and to bypass the Sideling Hill, Rays Hill, and Laurel Hill tunnels. 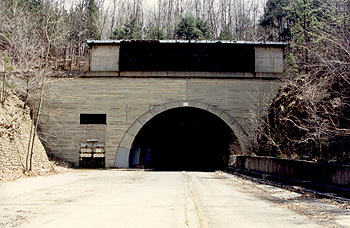 These last three tunnels, along with a large travel plaza, encompassed 13 miles of the turnpike that was bypassed, and is known today as the Abandoned Pennsylvania Turnpike. This stretch of paved roadway has not gone unused in the last 40 years. The Internet is full of documented trips by nature lovers, bikers, and other outdoor adventurers who have explored the roadway and the tunnels. 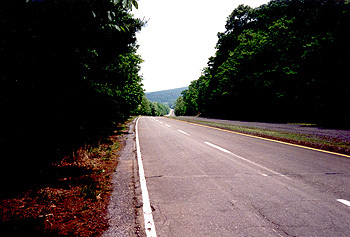 Rumble strips and road reflectors have been tested on the old road; the military has trained troops in the area, and several movies and musicals have used the area as background scenery. The Southern Alleghenies Conservancy, which owns one 8.5 mile strip, is determining ownership of that strip between counties. Once ownership is established, some needed repairs and resurfacing will begin, and possibly lighting will be added in the tunnels. The Abandoned Pennsylvania Turnpike is not officially open, but the public can go there on an "at your own risk" basis. 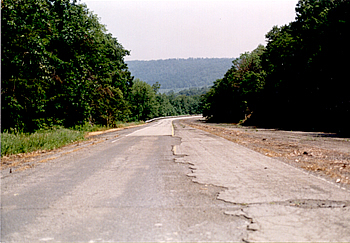 The eastbound lanes of the abandoned turnpike west of Ray's Hill tunnel. Although closed since 1968, this stretch of pavement between tunnels is in good condition. *Many thanks to Ms. Christine J. Baker of the Pennsylvania Turnpike Commission for contributing the photographs in this article.